Cake decorating using a baking airbrush kit is a hobby currently growing fast in popularity. Surely you can use a brush for cookie or cake decorating, but using a baking airbrush kit make it so quick and easier. Instead of coloring the fondant or the icing, you can just use the airbrush and spray on the cake or on your cookie. It will save you all the kneading time mixing the color into the sugar paste. Much faster and more economical as it requires less food coloring. Airbrushing is a fantastic way to decorate the icing or fondant of cakes. You might have used the traditional methods to decorate your cakes, but if you decide to use an airbrush for cake decorating, I can assure you that you will take your cake and cookie decorating skills to a whole new level. As with other arts, practice is necessary, but if you get the right airbrush kit, you will be starting on the right track. 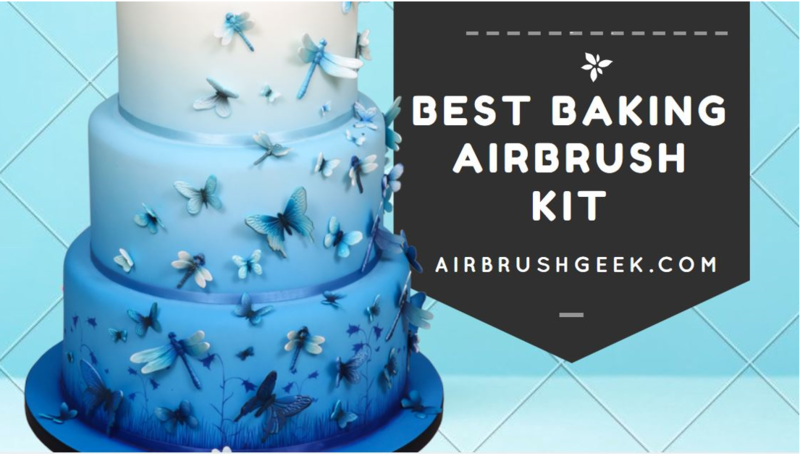 Whether you are a just starting at decorating cakes or a more experience baking artist, I want to help you choose the right airbrush cake decorating kit. Cake decoration as a hobby or to make money? What else do you need for airbrushing cake? Moody Blues Airbrushed Cake by Lisa Munro. Like this article? Pint It ! Those following kits are the best airbrush for cookies and for cake decorating. The Complete Master Airbrush Kit has everything you will need to get started if you are a beginner or more experience cake decorator in bakeries or home kitchens. This baking airbrush kit includes Model G34 Dual-Action Airbrush (great for detail work) and Model E91 Siphon Feed Airbrush (great for high coverage work). It come with the Master TC-20 Air Compressor which is a quiet 1/5 HP Airbrush Compressor, very light-weight and compact with carrying handle. The TC-20 has an automatic On/Off Shutoff which shut it down when the pressure reaches a certain level. The Master TC-20 Air Compressor has an air pressure regulator with Gauge and Filter for Dry Air with Precise Airflow Control. (FREE) How to Airbrush Training Book to Get You Started, Published Exclusively By TCP Global. Air regulator with gauge, very important to stay in control of the air pressure. Can be a bit hard to put together if you are a complete beginner but if you carry on ready this post you will be fine. The PointZero Airbrush deluxe cake decorating kit is a fantastic kit. It comes complete with all the equipment and supplies required to create gorgeous, professional-looking cakes. The PointZero cake decorating airbrush kit comes with no less than 3 airbrushes! 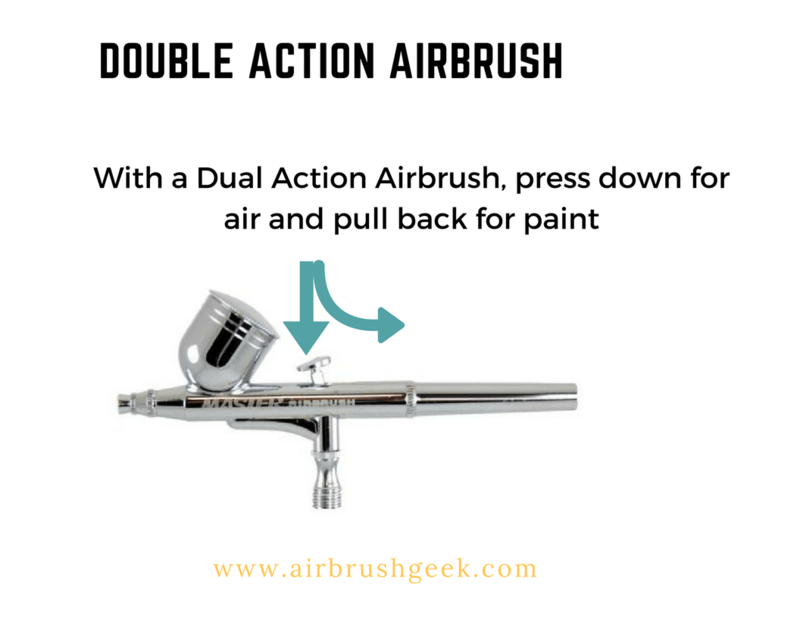 Two dual action airbrushes for detail work and one single action, easy to use airbrush for high coverage work. This really make the Pointzero cake decorating kit perfectly suited for both beginners and advanced users. The PZ-258 is a dual-action, internal-mix airbrush with a .35mm nozzle ideal for detailed work. The spray patterns with this model of airbrush are between thin-line and 1-1/2″. The PZ-260 is a dual-action, internal-mix airbrush with a .3mm nozzle also great for sharp detail Spray patterns with this airbrush vary from hairline to 1-1/4″. The PZ-276 is a single-action airbrush featuring an external-mix design; the spraying medium is atomized outside of the tip, making this airbrush less prone to clogging. Suited for high coverage, broad spray patterns between 1/4″ and 2″. With this kit, you will really have everything to get you started decorating your cakes, cookies or pastries.Boxed set for easy setup includes an Elite-125X air compressor, PZ-260, PZ-258 and PZ-276 airbrushes, a tabletop stand, a 10’ braided hose, two 22cc glass bottles, 5cc & 7cc color cups, paint pipettes, nozzle wrenches and instructions, all from PointZero. The PZ-258 and PZ-260 have a needle backstop that allow you to pre-set the trigger travel, helping to produce consistent line widths. This baking airbrush kit includes 12 bottles of highly concentrated, spray-on food-coloring paints from Chefmaster, made in the USA. These non-toxic, deeply pigmented paints provide superior coverage, even on hard-to-color, non-dairy whipped toppings and icing. The cake Boss baking airbrush kitt is a much more compact kit if you compared it to the Master or the PoinZero Kit. The chrome-plated single action airbrush is powered by a sturdy, compact 18 PSI compressor unit, and offers 3 levels of steady airflow: High when you want to do high coverage on your cake, medium for basic designs and low for more detailed work or when you want to write script on your cake. Airbrushing might look intimidating but really all you need is a bit of practice, and in no time, you will create beautiful looking cakes or cookies. Use the cake decorating airbrush to create colorful backgrounds or airbrush over stencils; also ideal for writing phrases and adding detailed designs. This baking airbrush kit includes a rubber hose, plastic dropper, special nozzle wrench, A/C 12V 50Hz/60Hz adapter, instruction booklet and case. You can follow the Cake Boss YouTube channel and see this cake decorating airbrush kit in action. The compressor has 3 different levels low medium and high. Rather good looking kit as well! The U.S. Cake Supply cake decorating Airbrush Kit has everything you need to start your journey into the cake decorating world. This baking airbrush kit is very easy to use and can can be enjoyed by everyone from kids to adults and beginners to experts! Just add a few drops of color into airbrush cup, power up the compressor, pull the trigger and that’s it! It’s just that easy to start your own customized creations! This baking airbrush kit contains everything you need to start creating edible masterpieces using your own personal creativity. The kit comes with 12 U.S. Cake Supply airbrush food colors, enough to get you started. Would have been nice to have a storage case for this baking airbrush kit. Before you jump ahead and buy a airbrush gun for cake decorating, there are few things you need to consider. Are you planning to use your baking airbrush kit at home once or twice a month to decorate you own cakes,cookies or pastries? Are you a real beginner and you want something easy to use, light and easy to put away. Then you could buy one of those baking airbrush kit that come with a compact mini compressor. Those small compressors are diaphragm compressors that can’t run continuously for too long as they will overheat and get damaged. But they will work perfectly for small 20 minutes burst. Look for compressor with a way to regulate the pressure. A good small compressor from a cake decorating kit have a way to adjust the air pressure, usually a knob for low, medium or high pressure. If you want for info about compressors, see my compressor buying guide . Then you need to buy a baking airbrush kit a with larger compressor. They will allow you to work continuously for a longer time. Also, those compressors are equipped with an air regulator,a pressure gauge, and moisture trap that remove any moisture that builds up in the compressor air line(ideal if you live in hot and humid climate). The pressure gauge allow you to control how much air the compressor is feeding through the hose. For cake decorating, you will work with low air pressure. So if you setup the air pressure on the compressor at 30 psi, you know that the air pressure won’t go past that value. Therefore, you will avoid the air pressure being too high, and the colors to bead on the surface of your cake, or even to create dents in the icing, especially if the icing is soft. If you already have an airbrush, then all you need is a compressor. For cake decorating, a compressor with a tank is not necessary but can be nice as more quite and provide that constant regulated pressure. You will need something portable that can deliver low air pressure. Compressor such as the Master Airbrush Air Compressor Model TC-20, or the Iwata Studio Series Ninja Jet single piston compressor, would be perfectly suited for your cake decorating. 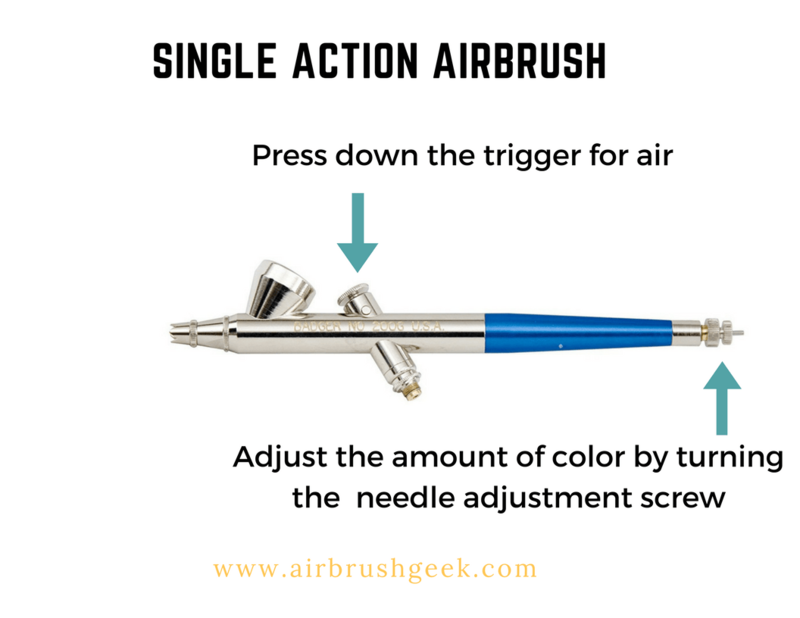 There are a lot of different types of airbrushes out there and each one is better suited for specific applications.There is few things that you need to consider before buying an airbrush for cake decorating. I recommend you read my airbrush buying guide to better understand the different elements to take into consideration. A single Action Airbrush would do the job perfectly if you want to decorate your cake with an airbrush. The more you press the trigger or the further back you pull the trigger , the more color will be sprayed. A double action airbrush is better for finer detailed work. The control is important if you want to do more than just spray a background. A double action airbrush is a bit more difficult to use when you are a beginner. Obviously food coloring is essential when decorating cakes or cookies. If you have amazing good looking Stencils, chance are that you will also have beautiful cakes! Stencils can be used along with your airbrush on your sugar-paste or fondant cakes to create beautiful and lifelike pattern The can also with chocolate and for simply dusting on a design usingicing sugar or cocoa powder. Stenciling is a art that has been used for centuries, it is easy to achieve amazing results that will literally transform your cakes and cookies into masterpieces. Just follow the few expert tips from that you can find in the cake decorating tips section below. Whether you’re a home baker or a professional cake decorator using your baking airbrush kit , an icing turntable is invaluable when it comes to decorating a cake. And the turntable is not only useful when airbrushing you cake: when piping a border, icing, combing the sides, spooning out your cake, the turntable will make it so much easier for you. Hold your airbrush in one hand and gently rotate the turntable with the other, et voila! This specific turntable comes with a 3-inch raised base that has a non-slip edge to keep the turntable from moving on your work surface. This will give you peace of mind when piping or buttercreaming your cake. The rotating cake stand can hold a cake up to 11-inches diameter with the platform still visible and can even accommodate a larger cake on a cake board. It is important to protect the surrounding area from airbrush color when working at decorating a cake. If you are at home, you can use some cardboard and build an enclosure where you can work without messing up your entire kitchen. If you are looking for something more professional, you can get Airbrush Spray Booth that come with turntable, a high volume fan that will extract all your over spray. The main one is that it allows you to clean your airbrush without any overspray . When you have a bit of color left in the cup, just insert your airbrush in the cleaning station and press the trigger to purge the remaining content. Same if you want to clean your brush after you have finish decorating your cake. Insert water in the cup and spray into the cleaning station.Some people put a piece of paper towel inside the station to limit the amount of mist coming out from the top of the cleaner. Just remove it after each session. It can also be used as an airbrush holder on your countertop which is very practical. Rather inexpensive piece of kit that really makes your life easier. To clean the station, just put it in your dishwasher! Easy! This decorating kit for cake, cupcake, and cookie frosting t includes 36 different pastry tips, two 12-inch reusable silicone pastry bags, two plastic couplers to hold the tips, and two flower nails with which you can create all types of patterns on cake, cupcakes. The Kootec decorating kit come with 36 high quality stainless steel icing tips that will allow you to do many decorating patterns: 11 open star tips, 7 closed star tips, 3 french tips, 3 round tips, 2 plain tips, 4 leaf tips, 3 rose petal tips, 3 special tips. 0.7 inch in diameter, 1.26 inch tall. The parts can be washed in the dishwasher, making it easy for cleaning. When you’re done decorating your masterpiece, there’s a plastic storage case so you can keep all your supplies together. This cake lifter is perfect when you want to transfer a cooled cake layer from a cooling rack onto a decorating turntable or if you want to move the cake you have been decorating from the turntable to the cake stand without any effort. Without this cake lifter, even moving your cake from cooling rack to a plate can be risky, since the cake can crack if it’s not well supported. Here I will give you some cake decorating tips from me but also from some of the biggest cake decorating experts. Avoid contamination and always use your airbrush with food safe, FDA (Food and Drug Administration) approved colors. Make sure you never use an airbrush for foods after it has been used for non-edible media such as paint. 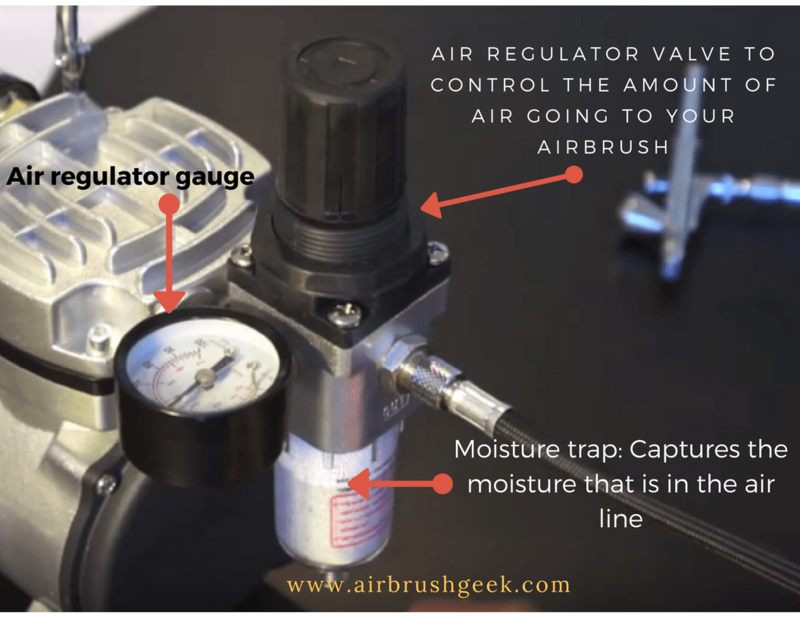 Of course you can use the compressor from any of those airbrush decorating kits with other project,like nail painting or Airbrush makeup for instance with the smaller compressors, but also model making or illustrating art with the bigger ones. Also, the closer you are from the cake with your airbrush the darker the color of shading will be. As a rule of thumb, try to hold your airbrush at least six inches away from the cake or cookie to have blotch-free designs. Back and forth movements should only be made if you are able to work on and off your object, like when using a stencil. When airbrushing stencils, make sure you hold your airbrush in a 90 degree angle. Careful when using water base colors with stencils: Stencils get saturated very quickly and color will drop down from them (under spray). Water based food coloring is cheaper than ethanol based food coloring. You can only ever airbrush water base color onto sugar paste. This fantastic looking cake is the one you can see on the feature image of this post. You can find the step by step guide to make this cake here. This is a tutorial for an Ombré fades cake, very easy to follow, with great explanation from Lisa Munro. I think it could be a nice project to try if you are a beginner cake decorator looking for well documented project to do. 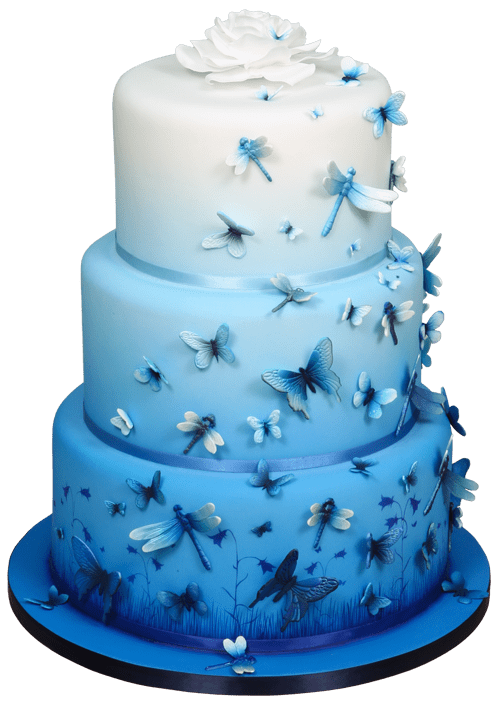 There are butterflies and flowers to enhance the decoration, making this moody blues cake visually stunning. Why don’t you try to impress your friends or family by making this cake for the next family occasion?